Turquoise Moon | Marie Antoinette's children. Marie-Therese of France (1778-1851) was the only one of Marie Antoinette’s four children to survive in to adulthood. She was born a few days before Christmas at the Palace of Versailles. As was the custom of the day the room was crowded with witnesses and the windows kept shut in case of evil air. As a result Marie Antoinette nearly died of suffocation till the windows were thrown open and the crowd dispersed. 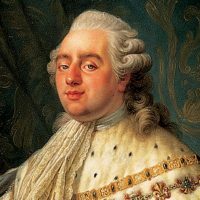 For his future three children, the king (Louis XVI) banned all witnesses apart from close family and allowed windows to be opened. Marie Antoinette was delighted with her baby girl, who she nicknamed Mousseline (meaning either a very light mousse or a delicate fabric) and she famously declared “had I had a son he’d have belonged to the state but you will belong to me”. Both parents adored the little princess. The king was indulgent and spoiled the child, played with her, and had her dressed in the finest. 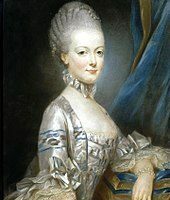 Marie Antoinette was far more strict and, despite her sheltered life, wanted the child to know and understand the people over whom her father ruled. Marie Therese regularly accompanied her mother to the palace gates to give food and clothes to the poor … and the poor were everywhere, clamouring round the kitchen gates, begging at every street corner. The story of Marie Antoinette saying “let them eat cake” is fiction. 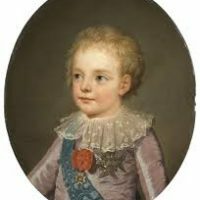 Marie Therese’s baby brother, Louis Joseph, was born three years later in 1781, followed by Louis Charles in 1785. Another girl, Sophie, was born in 1786. 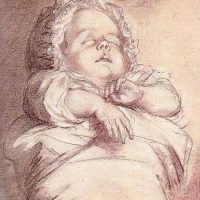 The elder boy, Louis Joseph, lived only till the age of 7 and his death was barely 2 years after the death of his little sister, Sophie. Marie Antoinette was inconsolable. She had always been homesick for her native Austria and had difficulty fitting in to the French court at Versailles. At Sophie’s death she said “my daughter would have been my friend”. In 1789 revolution broke out in France. It had been simmering just beneath the surface for many years. People wanted to see the same changes England had seen a hundred years earlier. These changes had also taken place in free-thinking America, Prussia and Flanders. The French wanted the same – more equality, less interference from the church, the non-absolutism of the king, religious freedom and so on. Although the French court was very grand, and French was the language of the educated classes, politically and socially France was 100 years out of date. At first the French proletariat were pro the Royal family -after all, Louis was the king, and as such held a place of honour in the mind of most of the population. But the tides turned, as these things do, and both Louis and Marie Antoinette were imprisoned in Tour de la Temple (Paris) along with their two surviving children and Louis’ sister. The king was accused of treason against his people. The aims of the revolution shifted daily, opinions and laws changed rapidly back and forth as government leaders jostled for supremacy and power. The mob got out of control and the Reign of Terror began. 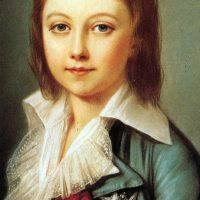 The king was executed by guillotine, leaving Marie Antoinette and her two children alone in prison along with the king’s sister..
For some reason Louis Charles, aged 8, was removed from his mother and put first in to a separate cell, and then housed with a poor cobbler living nearby. We don’t know why Louis Charles was moved. Many would not have wanted him dead. In later years Marie Therese recalled how her mother begged her jailers to let the little boy stay with her. 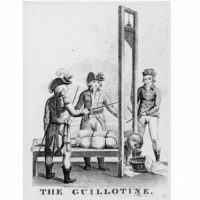 In 1793 Marie Antoinette was also guillotined, and then her sister-in-law. When Napoleon came in to power in 1804 he declared that the murder of the queen was the unforgivable shame of France, and was “a crime worse than regicide“. Technically, Louis Charles was now king of France. Incarcerated and sick with TB in a damp room, many referred to him as little King Louis XVII. He died orphaned, cold and alone in 1795. This left just Marie Therese. She was sixteen when she was released from prison and, with the help of the few friends who had survived the reign of terror, she made her way to Austria where she married Louis Antoine, Duke of Angoulême, who was the eldest son of the future Charles X, her father’s younger brother; thus the bride and groom were also first cousins. 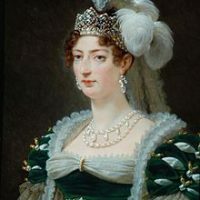 After her marriage, she was known as the Duchess of Angoulême. She became the Dauphine of France upon the accession of her father-in-law to the throne of France in 1824. Technically she was Queen of France for twenty minutes, on 2 August 1830, between the time her father-in-law signed the instrument of abdication and the time her husband, reluctantly, signed the same document. Marie Therese had lived through horrors and grew in to a thin-lipped and distrustful woman. She had been raped several times while in prison and that, along with starvation and suffering, left her unable to have children of her own. She spent many years in England and in Scotland, always reluctant to return to Paris. Many young men claimed to be her little brother, which was distressing for her, and she never fully recovered from her ordeal. Six more kings (and 3 Napoleons) came and went after the revolution which remains one of Europe’s most blood-thirsty, pointless and shameful periods of history . 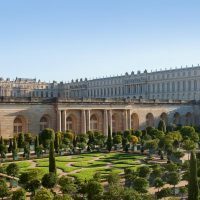 Interested in France ? 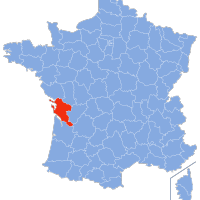 Visit www.seasidefrance.com to book your holiday in the sunny Charente Maritime.